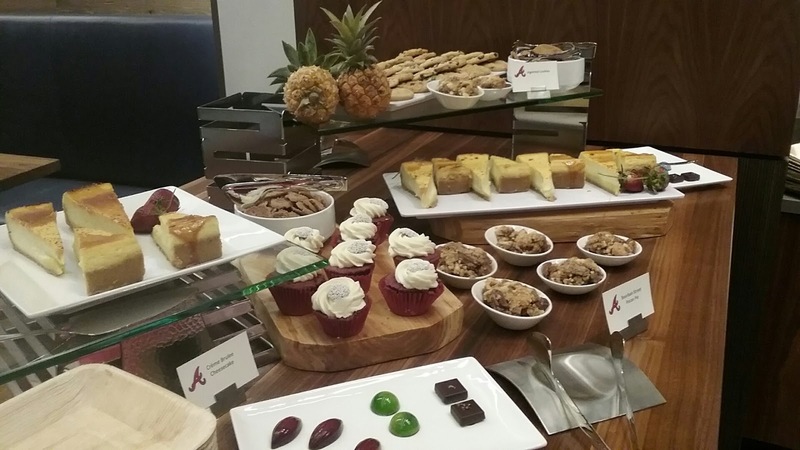 Recently I had the chance to join the Braves for a night of food and frivolity at their new Delta SKY360 club which is located underneath the seats behind home plate. The club is about 15,000 square feet of space, lined with golden gloves and silver sluggers of Braves players from over the years, and centered with 2 bar stations and a slew of food stations at the far end. It looked like it could easily seat 200 people with little issue, and probably hold up to 500 in a pinch with standing room. You enter the club through an elevator located on the third base entrance of the stadium, and you descend to a lower level walk around a concourse. When you follow this tunnel, you take a left into the club proper, and you're immediately greeted with the Silver Sluggers lining the wall as you turn. Here's a picture of the bar as you enter into the club, it's a full wraparound situation with 4 bartenders working, along with people helping to order drinks for the tables. If you see people blurred it was because they were running that fast to get their drinks! As you look at the far end of the hall, you see the buffet setup. 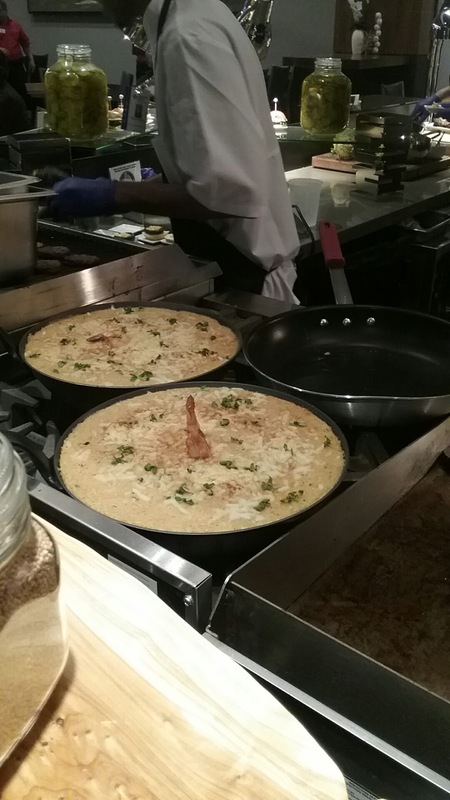 The first station is a Chef's Island where they are preparing handcrafted dishes like Kobe Beef Sliders, Shrimp and Grits, Pork Belly Tacos, and Chicken Caesar mini salads. I took a quick picture of the station where they had the Shrimp and Grits cooking in the back pans. 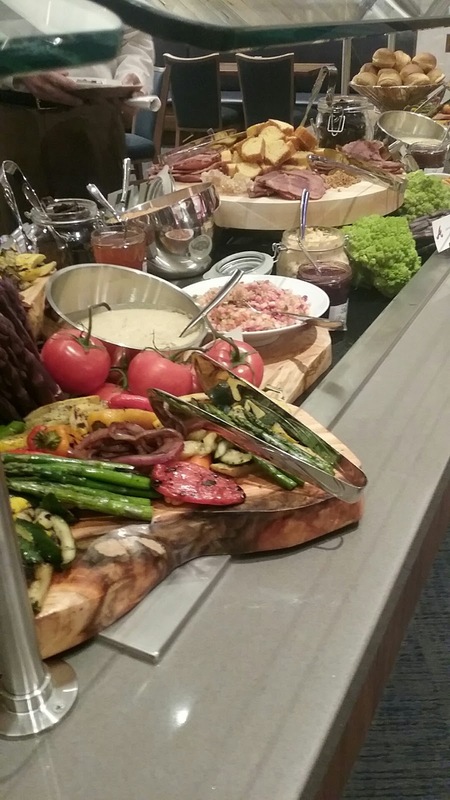 Next up, you have the cold foods buffet, where you could get items like hummus, grilled veggies, rolls, crackers, cheeses, cold cuts, various sausages, three different types of salads, and other assorted dressings and goodies. I took a long shot of that table here. What really struck me with the food was the quality. 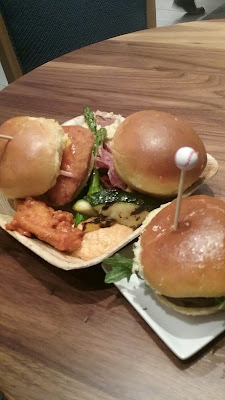 It not only tasted good, but the professional layout of the different items had me thinking of the offerings from a four-star restaurant rather than the food I'd get at a ballpark. This has it's obvious pros and cons, as we come to the ballpark to watch a game, but with all the amenities you might find yourself more interested in the food and drink than sitting and watching the game. Decisions, decisions. It's a tough life. 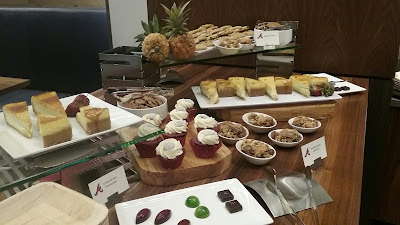 Here's the slider trays that I tried and the dessert buffet below. All that being said, we're not just here for the club, we're here for a game, and as you walk outside to the seats you're immediately greeted by the ushers who are happy to point you to your section. I stood in the proximity of our seats to give you a shot of what the field looks like, and you can get a sense of the right field Chophouse in the background. The actual view of the park will seem very familiar to all fans when they see it. The differences will be apparent when you walk around. The seats are nicer, padded, and closer to the action in the Delta Club area. There are giant fans in the concourses to provide a breeze in the summer. The Chophouse now has several rails for standing rather than one giant overlooking rail from the top. The restaurants and areas are upgraded and serving top end fare. It's all one big attempt to improve the fan experience from top to bottom, while leaving the actual field and views very familiar. All in all, I really enjoyed my trip to see the Delta SKY360 Club, and I'm excited about seeing in more in the future. 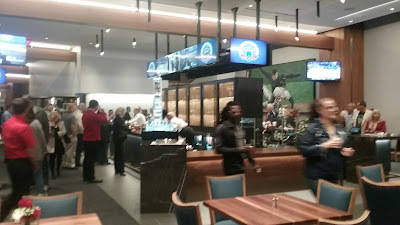 Yes, it's for a limited group of fans (what I would really call SunTrust Club 2.0), but they've improved more than just that area. You can get a sense that the Braves organization really wanted to make this ballpark for the fans, so they'd have something to eat, drink, and do before every game. They wanted to have a surrounding battery of restaurants, bars, apartments, and shops so that fans wouldn't feel like they had to just show up at 7PM and leave at 10PM. 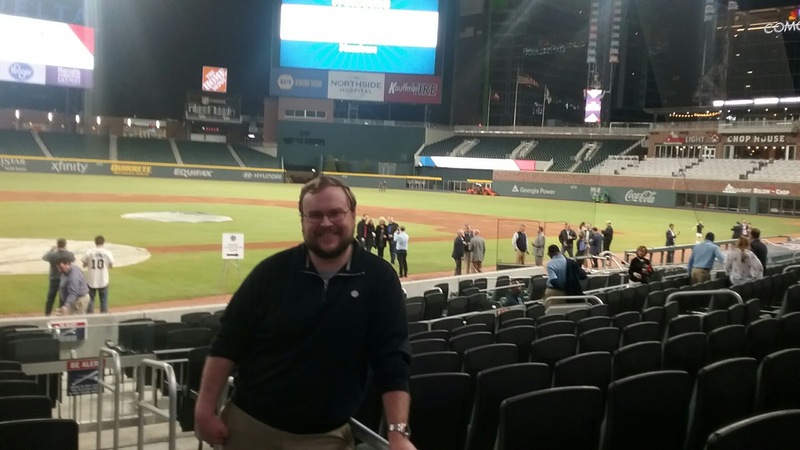 We all know the downsides that the area around Turner Field had, and this ballpark is a direct answer to those concerns whether you were in favor of the move or not. I've personally been unabashed in my support of the move. The people who are paying the most money in season tickets were VERY in favor of the move. And as we know with anything, the businesses will follow the money. That being said, I think this ballpark will have something for the fan spending $20 all the way to the fan spending $300 a ticket. I think it will also be a place where you can actually feel comfortable walking around the park, visiting the surrounding merchants, and spending a leisurely Saturday tailgating with friends. Plus it will be a great day when the product on the field starts to match the quality of the stadium!